[PCASC] La historia es nuestra y la hacen los pueblos. Between peoples there are no borders. ¡Que viva la solidaridad! A documentary film by the film collective Calle y Media chronicling the lives of two men living on the streets of Caracas in the middle of a right-wing push to reverse the gains of the revolutionary process in Venezuela. The lyrical wisdom of the Old Man and the explosive word of Jesús, demonstrate the liberatory commitment of the people of Venezuela, beyond the influence of leaders or any enlightened vanguard. This film is the documented prophecy of a rebellion that minute by minute silently plots from under the bridges and the sewers a world that will sooner of later rise up thirsting for justice. Jobs with Justice "Jobs Emergency Day of Action" where will will deliver the petition below! Tell your friends. Rally for Jobs. Hands off Social Security and Medicare. 5:15pm: Rally @ Sen. Wyden’s Office 911 NE 11th Ave.
Dia de la Independencia? Clinton ponders further US. intervention in Mexico. Obama tries to do damage control. Was Clinton really off message or did she just let the cat out of the bag at the wrong time? Read Laura Carlson's excellent piece. Since our last appeal, heavy rains, flooding, and landslides have wracked Guatemala. Al Jazeera notes the President's observation that "weeks of heavy rains – including the latest torrent brought on by Hurricane Frank – had caused between $350-500 million in destruction across the country". Climate change disproportionately affects communities with poor infrastructure- meaning that those communities with the smallest carbon footprint are often those most vulnerable to it's impacts. Read more from Rights Action. Alvaro Uribe teaching at Georgetown. Denies human rights violations by his administration. WHAT? Latino student arrested for speaking up during lecture. 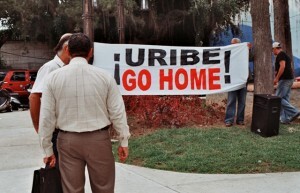 This is part of the "Adios Uribe" student-community campaign against impunity for the former head of state's crimes against humanity in Colombia. Colombian Father Seeks an End to Impunity: Pilgrimage for awareness begins Sept. 20th. On the bright side in Mexican Standoff- A state assault on unions, it looks like the Steelworkers and the Mexican miners are discussing a merger to build cross-border solidarity! human rights and social justice throughout the Americas. where we plan and evaluate our work to build cross-border solidarity in the Americas.